Our project classes will inherit the field Id from this abstract class (if you want you can add other fields like CreatedAt or CreatedBy). Then we create the Country class with the properties that defines a Country. Now to make the exercise more interesting, we are going to assume that we do not want to expose all the Country class. In the Dtos folder, we create the following CountryDensityDTO class. This class exposes Name, Capital Area, Population and a calculated field Populationdensity. Now we will continue with the Infrastructure layer and then we will finish the missing parts.We go to the Infrastructure folder and create a library Net.Core 2.1. We name it WebApi.Infrastructure.Data. In the Context Folder, we add the SqlServerContext class. We refer to our Country entity with DbSet to work with the database. As we work with CodeFirst approach, we will create a mapping for our entity Country in the database. Optionally, in this part we can also add seed data when creating a table. In the folder, EntityDbMapping, we create the CountryMap class. In this class, we define the physical representation of the properties of the Country class as fields in the table of the database. In the next chapter, we will implement validations with FluentValidation. We will also configure Mapper to use it with our DTOs and will implement Identity using Jwt. Background tasks play a very important role when we are building a distributed system. The most common scenario is consuming the service bus's message. In this article, I'd like to present how to consume the RabbitMQ message via BackgroundService in ASP.NET Core. 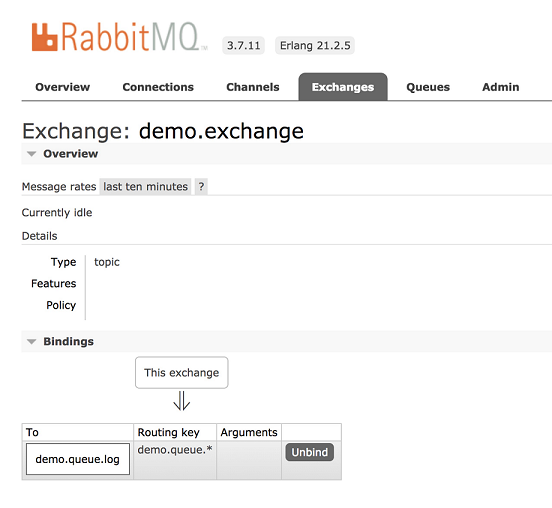 We should set up an instance of RabbitMQ. The fastest way is to use Docker. After running the Docker container, we are able to view the management page via http://localhost:15672. Here, we create a new class named ConsumeRabbitMQHostedService that is inherited from BackgroundService. BackgroundService is a base class for implementing a long-running IHostedService. It provides the main work needed to set up the background task. 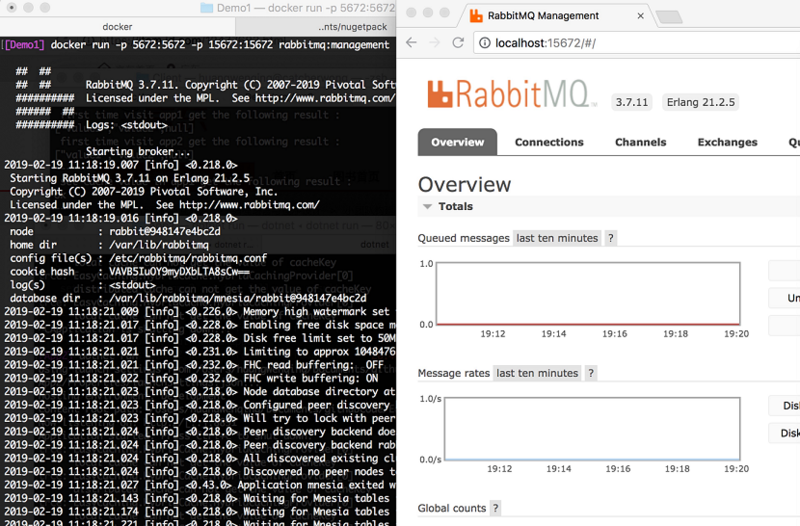 Here is an example to demonstrate how to consume RabbitMQ messages. We should configure this hosted service with the background task logic in ConfigureServices method. After running this app, we may get the following output in the terminal.Turning to the Management UI of RabbitMQ, we find that it creates a new exchange and a new queue. The next time we try to publish a message to show the background task is running well, we get the following result. When working with ASP.Net Core in Docker containers, it can be cumbersome to deal with certificates. While there is a documentation about setting certificate for dev environment, there’s no real guidance on how to make it work when deploying containers in a Swarm for example. In this article we are going to see how to take advantage of Docker secrets to store ASP.Net Core Kestrel certificates in the context of Docker Swarm. First of all, we are going to create à Swarm service on our machine that use the sample Asp.Net Core app. The purpose of this article is to make SSL work in the container withoutchanging anything to an existing image. We are creating service mywebsite, publishing only one port 8080 bound to the port 80 in the container using the host mode and using the image microsoft/dotnet-samples:aspnetapp. Please note that you can use others configuration (for example expose port in routing mesh mode). We need a certificate. It can be created via an external certificate authority but here for the sake of the article, we are going to create a self signed certificate (of course, don’t use this in production). We are using Powershell for this task (you can skip this if you already have a pfx certificate signed by a real CA). $cert = New-SelfSignedCertificate -DnsName "mywebsite" -CertStoreLocation "cert:\LocalMachine\My"
Once you have your pfx, we are goind to unprotect it from the password. It might be seem unsecure but when it will be added to the Docker secret store, it will be stored securedly. For this task I will use OpenSSL (not possible with Powerhsell as far as I know). OpenSSL is provided with Git for example. Now that the pfx is un protected, we can add it to the docker store certificate and display it. Our secret being in the store, you can delete (or store securely somewhere else your pfx). We can now update our service to take in account this secret. When adding a secret to a service, Docker will create a file in a specific directory containing the value of the secret. On Windows it’s c:\programdata\docker\secrets. Let’s update our service and see what happened inside the container. 11/15/2018 10:38 PM <DIR> . 11/15/2018 10:38 PM <DIR> ..
We can see that our secret exists and is named kestrelcertificate, as we named it in the command line. We can therefore update our service to remove the old binding on port 80, replace it with a binding on port 443, tell Kestrel to use this port and finally give Kestrel the path of our secret. Wait a while that your service update, try to browse and it should work ! Well, actually it should only works on Linux. If you try to have a look a the logs generated by your service, you should end with something like this. mywebsite.1.uy3vm8txwxec@nmarchand-lt | Unable to start Kestrel. We can see a nasty bug of Windows here (Github issue). What did happen ? If you look closely at the dir command we made in the container, you’ll see that the secret is not really a file but instead a symbolic link to an other file. Unfortunately, Windows is unable to use a certificate that is a symlink. One solution could be to manually read the certificate with File.ReadAllBytes() and pass it to the constructor of X509Certificate. However, it would be against the purpose of this article which is to not modify the Docker image. We can find a workaround by browsing the Docker documentation which states that the real file containing the secret (which in fact is the target of the symlink) can be found in the path c:\programdata\docker\internal\secrets\<secretid> where secretid is the id of the secret (as shown by docker secret ls). We can update our service to change the path by updating the environment variable. It now works also on windows! We have seen in this article how to use Docker secrets to store ASP.Net Core Kestrel certificates in our Docker Swarm. However, please keep in mind that the Windows workaround should be used with care as written in the Docker documentation. Another word also about SSL Offloading : I know that usually the reverse proxy (Nginx, Traefik, etc.) is used to be the SSL termination but sometimes you still want SSL end to end.